IMPHAL | Sept 6 : Institute of Bio-resources and Sustainable Development (IBSD) organised a one-day brainstorming session on ‘natural resource management and rural bio-entrepreneurship in northeast’ at the campus of IBSD, Takyelpat today. In his introductory speech, director of IBSD, Dinabandhu Sahoo said that northeast India has abundant of natural resources sharing 8 percent of India’s geographical area and one-fourth of forest area of the country lies in this region. However the socio-economic development of this region is still lagging behind when compared with rest of the country. The problem can be uprooted by tapping out resources in a sustainable way by utilising modern technology, he added. “For the sake of development, there is a rapid exploitation of natural resources that has created uncertainty in natural calamity. But the real development is still not achieving as there is a great economic disparity in the society,” said Dinabandhu. While sharing the economic disparity in relation to geographical area, he said that most of the regions of northeast India are rural areas where source of livelihood is the issue relying in natural resources. Because of this reason, differences in socio-economic status between the people living in rural and urban areas come into existence for ages, he added. However, the problem can be solved by adopting the programme like rural bio-entrepreneurship in all the entire region of northeast India. It will not only addressed the issue of environment and economic imbalances but also help to curb migration issue from rural to urban areas, said Dinabandhu. 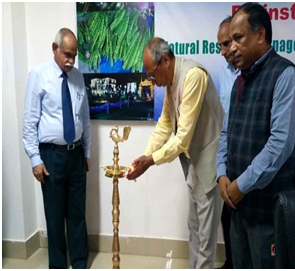 Speaker of Manipur Legislative Assembly, Y. Khemchand Singh, who attended as chief guest of the function, said that Manipur is known for its scenic beauty so to preserve and protect the environment is the utmost need. He assured of extending support in any step taken up by IBSD in conservation of environment. The programme was also attended by secretary of National Academy of Agricultural Sciences, Anil. K. Singh as guest of honour.